Fill Your Gun or another Carbon Fiber tank safely with this high pressure Nitrogen Regulator. We manufacture every type of Regulated and Un-Regulated Hose Assembly that you can imagine (SCBA, SCUBA, Helium, Nitrogen, Air etc.) for filling PCP Airguns, as well as Paitnball and other systems. If you don't see it below, just call 714-907-0067 and we will custom make one for you. 4) STAINLESS STEEL quick disconnect is a true Foster brand (not an imported knock-off). 5) For ease of use, the large machined nut that screws to the tank is a STAINLESS STEEL hand-tight, not a wrench-tight. (Nitrogen and Helium are wrench-tight). 6) The STAINLESS STEEL bleeder has a large easy to use thumbwheel, which is significantly better than tiny thumbwheels or pushbutton type for ease of use and dependability. 7) The 2.5" STAINLESS STEEL Wika gauge is glycerin filled, shows both PSI and BAR, is accurate, and very easy to read. 8) The Micro-Bore hose is 0.070" (less than 2mm) inside diameter (the smallest available) x 40 inches long and uses less air than a 4 inch x 1/4" diameter paintball hose. 9) Our hose is the highest quality available (not metal braided paintball hoses that are only rated only 1800 PSI for CO2 pressures and fail). The hose is rated at WORKING pressure of 630 BAR (Over 9,100 PSI!) with a failure rate of over 5:1! (about 50,000 PSI). Notice how the hose on the right has a kink. Ours are the ONLY hoses rated over 9,000 PSI with a strain relief at each end, (where all other hose usually kink and fail). Once a hose kinks, it should be replaced immediately or it could let go! You don't want to go cheap when you are working with +4500 PSI!!! (Good news, we have replacement hoses if you bought other brands). 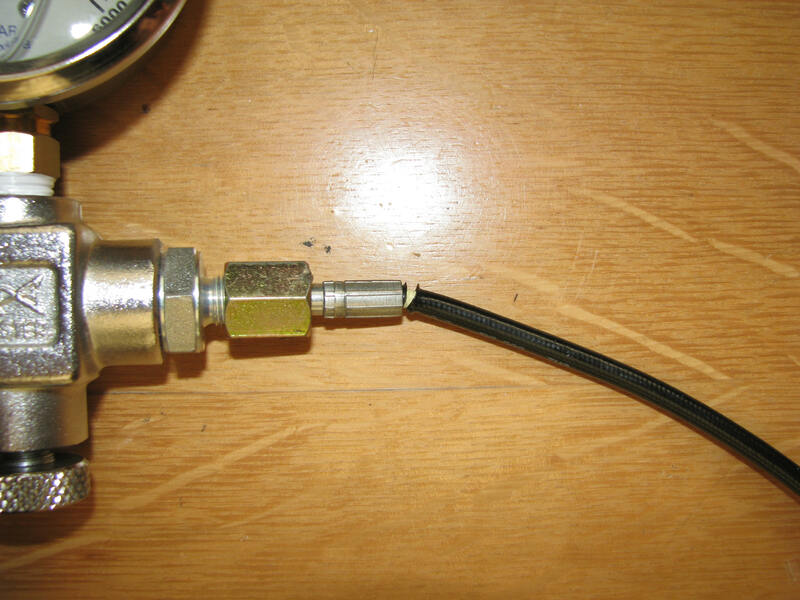 The hose terminates in a STAINLESS STEEL quick fill (sometimes referred to as a Foster type or paintball quick disconnect) for connection ease. This is not a CO2 pressure rated brass or chrome plated steel paintball quick disconnect that can't handle the pressure safely, but STAINLESS STEEL!!!. When purchased with a tank you will receive a significant discount on the hose assembly. WARNING We have seen paintball hoses (some have metal braiding) used on SCBA and SCUBA tank hose assemblies and these frequently burst. Those type of hoses are NOT rated for 4500 PSI, but instead only for CO2 pressures. Also, we have seen the brass or chrome plated "Foster" style female paintball disconnects used in some assemblies. These 12FS type Paintball quick disconnects. They are designed for CO2 pressure of only 800-1200 PSI and FREQUENTLY fail at these higher pressure. Remember, tanks may have up to 4500 PSI in them and Nitrogen have up to 6000 PSI. Please don't use under-rated products for YOUR safety!! !